The dystopian state of the democratic socialist nation, Venezuela is in the midst of a massive power blackout. With no end in sight, the blackout is the result of years of government incompetence that has caused the power grid to deteriorate. As citizens panic, the government continues to further impoverish and enslave the civilians making them suffer. 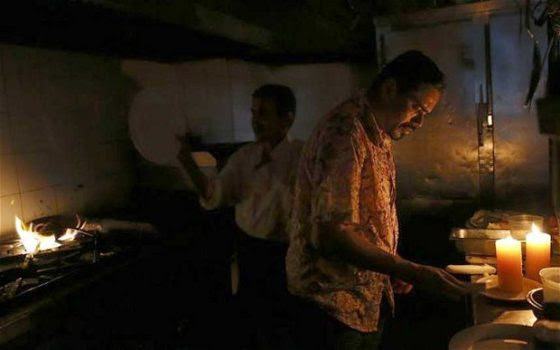 The power problems are a symptom of 15 years of socialist policies that have left the country without a reliable network despite having the world’s largest oil reserves. Late socialist leader Hugo Chavez nationalized the power sector seven years ago amid a wave of state takeovers, reported the Telegraph. “This is driving me crazy,” said Naile Gonzalez in Chacaito, a commercial neighborhood of Caracas. “The government doesn’t want to accept that this is their fault because they haven’t carried out any maintenance in years.” But that’s socialism. Once the government takes over and gets control and power over people and infrastructure, they do as they please. Governments in history have never cared about anything or anyone other than those who can give them more money and more power. According to Reuters, Winston Cabas, the president of an electrical engineers’ professional association, told reporters that several of the country’s thermoelectric plants were operating at just 20 percent of capacity, in part due to lack of fuel. He also said the biggest problem is the government and the rationing of electricity.